The evolution of elephants and related forms, collectively known as the proboscideans, is one of the better-recorded tales of mammalian evolution. Since its origin in the late Paleocene Epoch, about 60 million years (My) ago, the order Proboscidea witnessed a spectacular radiation until the end of the Pleistocene Epoch, about 10,000 years ago. 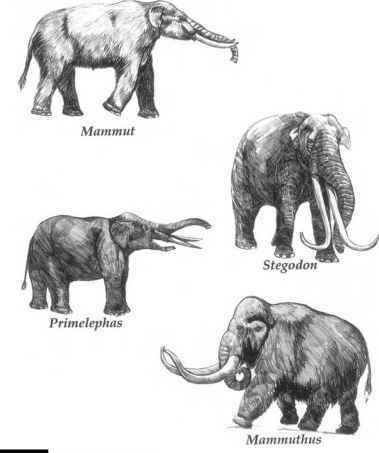 The evolutionary course of the proboscideans, marked by an overall increase in body size, also took many seemingly bizarre paths, including extreme dwarfism and morphologies (seen from the fossil record) that only the most daring paleontologist could have otherwise imagined (fig. 1.1). 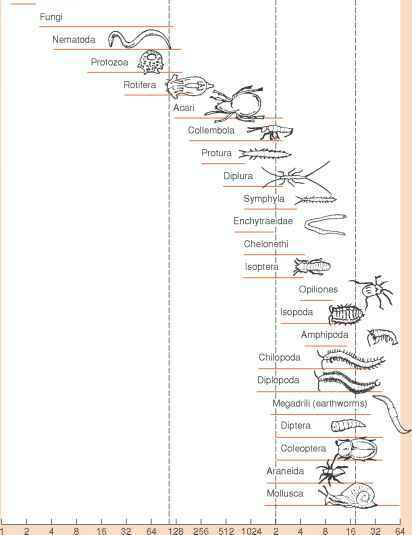 There are many examples of parallel and convergent evolution. During this period, the proboscideans occupied almost every continental habitat type, including swamps, tundra, boreal forests, deserts, savannas, tropical forests, river basins, and high mountains. With the exception of Australia and Antarctica, fossil proboscideans have been found in every continent. Adaptations in anatomy and physiology of the proboscideans were obviously as diverse as the spread of habitats they occupied. erium, weighing 15 tons, that lived in Southeast Asia about 25 My ago. 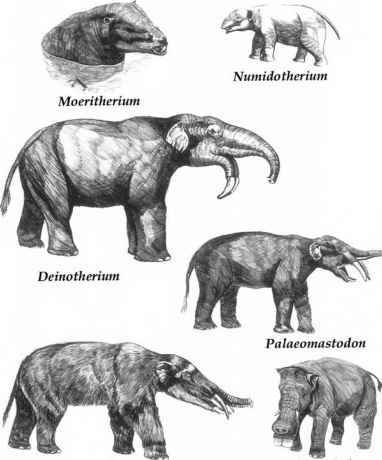 Nevertheless, some of the extinct proboscideans did reach a formidable size, even larger than the living elephants. still flourished across the continents from the Americas to Eurasia and Africa, although a decline was under way. Most of the proboscidean evolution had occurred in the Old World, with successive migrations to the New World. Yet, by the end of the Pleistocene, all but Elephas maximus and Loxodonta africana, had become extinct, along with a host of other "megafauna." Although the Pleistocene extinctions may not necessarily have been as severe as some of the earlier episodes of "mass extinctions" in the geological record, they were notable for their rapidity and impact on the larger mammals. About half of the mammalian genera greater than 5 kg in body weight became extinct during the late Pleistocene. Only tropical and subtropical Africa and Asia were left with anything like the diversity of larger mammals that flourished until recent times. The rich fossil remains of the proboscideans housed in museums around the world have yet to be exploited fully by scientists. Henry Fairfield Osborn's monumental work on the Proboscidea, published as two volumes in 1936 and 1942, described 44 genera and about 350 species. Since Osborn's tome, there have been at least two significant volumes on proboscidean evolution. The first, by Vincent Maglio in 1973, is considered the standard volume on the evolution of the true elephants—the family Elephantidae. The second is a multiauthor volume on proboscidean evolution; it was edited by Jeheskel Sho-shani and Pascal Tassy (1996a). As with the taxonomy and phylogeny of other animal or plant taxa, there are usually as many interpretations as biologists, and the Proboscidea have been no exception. In this case, the "lumpers" have latterly prevailed over the "splitters," with the result that only about 39 genera and 163 species were recognized as of 2001 (table 1.1). New fossil discoveries have also pushed back the origin of the proboscideans by several million years. Since its discovery at the turn of the twentieth century, a piglike creature named Moeritherium, with fossil remains first recovered from 50-My-old Eocene beds of Egypt by C. W. Andrews, was considered to be the oldest proboscidean. In 1980, a major shift in the geographic origin of the proboscideans occurred with the description by R. M. West of Anthracobune, another Eocene genus with proboscidean affinities from the northwestern Indian subcontinent. An African origin for the proboscideans was quickly reasserted with the discovery of Numidotherium from the early Eocene of Algeria. More recently, the description in 1996 of Phosphatherium from Morocco by Emmanuel Gheerbrant and coworkers not only strengthened the African origin, but also significantly pushed it back to the late Paleocene. The warm, shallow waters along the fringes of the ancient Tethys Sea, of which the Mediterranean is a remnant, provided the milieu for an extraordinary evolutionary divergence of two orders of mammals—the Proboscidea, which are the largest of the land mammals, and the Sirenia or sea cows, which are strictly aquatic today. Not only are the fossil ancestors of these two mammalian groups found together in the same geological stratum of the Fayum in Egypt, but also they share common features, such as double-apex hearts, with each ventricle separated from the other at the tip. The paleontologist Malcolm McKenna thus created in 1975 the Tethytheria, a superorder encompassing the Proboscidea, the Sirenia, and an extinct order called Demostylia, implying that the closest extant relatives of the elephants were the sea cows. This was a modification of another scheme of classification proposed by the famous evolutionist George Gaylord Simpson, who proposed the Paenungulata, which included the proboscideans, the sea cows, and the hyraxes in addition to four extinct orders. A shared character, such as the carpals or wrist bones arranged serially one above the other, justified this new grouping, termed Tethytheria under the Paenungulata. Known geological distribution of proboscidean genera. Source: Updated from Shoshani and Tassy (1996b). *Key to geological records: Pa, Paleocene; eE, early Eocene; mE, middle Eocene; lE, late Eocene; O, Oligocene; eM, early Miocene; mM, middle Miocene; lM, late Miocene; Pl, Pliocene; Ps, Pleistocene; eH, early Holocene; lH, late Holocene. tKey to continents on which remains of these genera were found: As, Asia; Af, Africa; Eu, Europe; NA, North America (including Central America for Zygolophodon, Mammut, Rhynchotherium, Stegomastodon, Cuvieronius, and Mammuthus); SA, South America (including Central America for Haplomastodon). The newest anatomical and biochemical evidence certainly supports the contention that the closest living relatives of the elephants are creatures such as the sea cows (manatees and dugong), the hyraxes, and the aardvarks. A 1999 article by Ann Gaeth and associates on the embryonic development of the African elephant strengthens the aquatic ancestry of the proboscideans and places them closest to the sirenians. The elephant fetus contains a curious structure called the nephrostome, a funnel-shaped kidney duct that appears by about the third month in embryonic development, but disappears by about the fifth or sixth month. Nephrostomes are characteristic of freshwater fishes (e.g., sturgeons), frogs, birds, and egg-laying reptiles and mammals (e.g., platypus), but are never found in the embryonic kidneys of present-day viviparous mammals. Their presence in elephants seems to be a throwback to their aquatic ancestry. Other embryonic features in the elephant, such as true intra-abdomi-nal testes, also suggest an aquatic origin. Although I briefly review proboscidean taxonomy and phylogenetic history (fig. 1.2), my objectives in this chapter are not to provide detailed descriptions of fossil proboscidean morphologies or get into hair-splitting debates of proboscidean relationships. The volumes I mentioned provide very detailed accounts of extinct proboscidean morphologies and phylogeny. Rather, my primary aim in this chapter is to review how climatic and environmental change over the past 60 My may have driven the "adaptive radiations" of the Probosci-dea, especially the lines leading up to the living elephants. I also dwell at some length on the possible role of climate change and hunting by humans on the Pleistocene extinctions. Last, I summarize the emerging molecular evidence from genetic (DNA, deoxyribonucleic acid) studies for relationships among the true elephants and for structure, diversity, and phylogeography within and between populations of the African and Asian elephants. Relating the complex radiation of the proboscideans to climate and habitat change over geological time spans is not an easy task. Our knowledge of the world becomes progressively fuzzier as we go back in time. A series of complex climatic episodes is reduced to an average value over several million years. Reconstructions of ancient habitats may be based on very indirect inferences that are, of necessity, extreme simplifications. The interplay of the earth's orbit around the sun, continental movement, oceanic circulation, climate, and vegetation change in the ancient world is understood only in broad terms. The fragmentary nature of the fossil record also does not help matters. Looking for fossils is often akin to searching for the proverbial needle in a haystack. While natural selection is widely accepted as the major driving force of evolution, all change need not have been an adaptive response. A character may have arisen and persisted in a particular lineage by chance alone, simply because this character was no more disadvantageous than an alternative character. It is obviously incredibly difficult to reconstruct in detail the niche of particular fossil species and what particular selective forces were acting on it. The extensive literature on proboscidean evolution offers only a few glimpses into this subject, much of it linked to broad trends observed in mammalian evolution. A 1993 account by eminent paleontologist Christine Janis of mammalian evolution, set against the backdrop of geological climate and vegetation change, however, offers an excellent framework. I used her basic sequence of global events and newer information from the literature in tracing the spectacular radiation of the proboscideans across the globe (fig. 1.3).